Andrew's DLP projects AMAZE us! 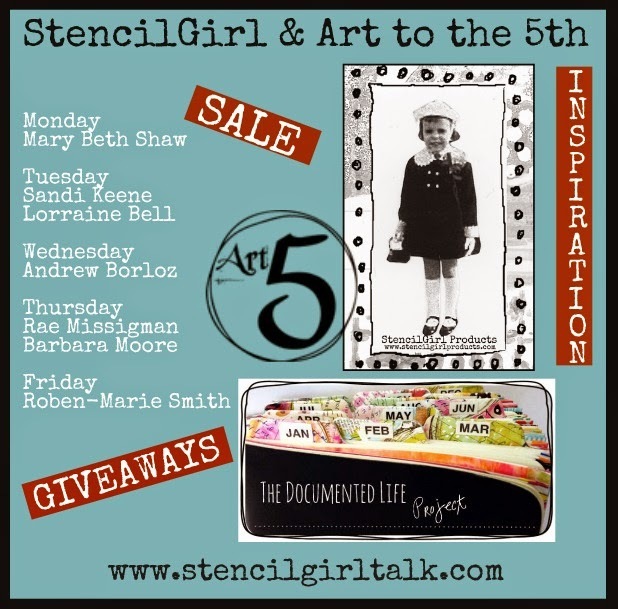 GIVEAWAY and see about our StencilGirl SALE!!! Hi, I'm Andrew Borloz, and I am a StencilGirl Artist. I joined TheDocumented Life Project group last December only because I liked the idea of using the planner to document the events & activities of my daily life with words and images. 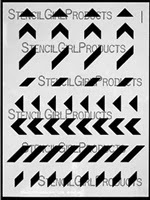 I often used the stencils that I designed for Stencil Girl Products, and I've provided several examples of how I use them. 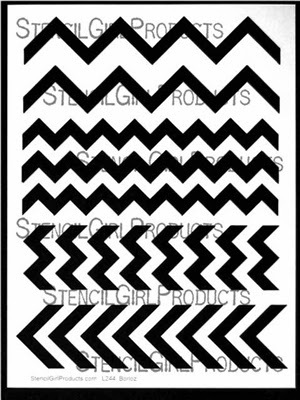 Shown below is one example of how I use one of my chevron stencils (L204). It is actually an image transfer from a laser photocopy of the stenciled paper. I first create several patterns with the chevron stencils, and then have them photocopied. I then applied several coats of acrylic gloss medium - allowing each coat to be dry before adding another coat. Once they're dry, I soak the paper in water and rub the paper off the medium. The image stays on the medium, and I used the same medium to attach it to the pages. I used the same technique for a column of chevrons on other page (shown below in the left photo). I sometime use the stencils directly on the page as a decorative element or to support the theme. For example, since the bottom of my boots has chevron design, so I used one of my chevron stencils (L244) directly on the background photo. Sometimes I would use more than one stencil on a page. For example, I selected the mini triangle stencil (L114) for the cover of a small booklet about triangles, and created this pattern by using as a template for drawing, and by using markers (poster paint and ink) to create colored triangles. 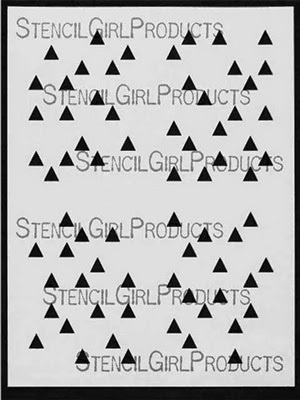 Mini Triangles is the Deal of the Day over at StencilGirl Products! The larger triangles were created with large diamond stencil (L111) and acrylic paint on a mixed media paper. I then photographed it, uploaded it to my computer and digitally manipulated it to create different proportions and colors. It was then laser printed and cut to fit. 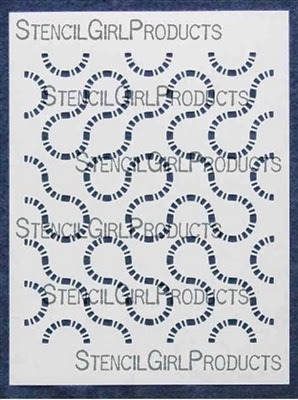 One of my favorite stencil design series is curvies - I have used them as a background, as a pattern for embroidery, and as a guide for cutting the slits to hold cards. For both of the above photos, I used curves dash stencil (L022). The left photo was done with acrylic paint and poster paint markers ("dots"). I also used permanent ink markers for shadings. The right photo is an image of a khaki fabric with the pattern created by using bleach paste. After the pattern was bleached, I embroidered various stitches to resemble various parts of a simple cell. For the photo below, I used the solid curvies (L023) stencil which contains a number rows that allows you to create your own patterns. I created my own pattern on a mixed media in such a way that it allows me to cut slits (with sharp knife) that will allow me to insert several cards. As you can see from the examples above, the stencils that I use were designed to allow multiple patterns to be created, and also to be used in different ways. I really enjoy using them because they're so versatile and so adaptive when it comes to trying out different methods & techniques for my DLP planner. Andrew loves and craves to find anything that is visually unusual & interesting. Ever since his first visit to New York World's Fair in 1964, he has been hunting for the unusual forms & textures anywhere he goes. Spent quite bit of childhood time with construction toys and building tree forts in his backyard. Graduated from University of Bridgeport with a degree in Industrial Design, and has designed exhibits for National Park Service, Federal Aviation Administration, NASA, and various toy manufacturers (showrooms). Also has done product designs for a few electronic & medical equipment manufacturers. Obtained his masters degree in computer science and worked in a pharmaceutical industry for seventeen years. 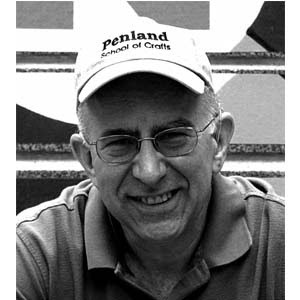 Before he left the corporate environment to return back to the creative field, he kept his creative spirit alive by traveling all over the country for various art retreats and workshops in paper arts, book arts, mixed media, collage, printmaking and letterpress printing. He is currently self-employed as a designer/artist/instructor, and is a member of Nature Printing Society and Center for Book Arts. You can find Andrew on his Facebook Page Andrew Borloz-Urban Paper Arts. You can see all of Andrew's stencils HERE. in honor of Mary Beth's Birthday......having a sale! 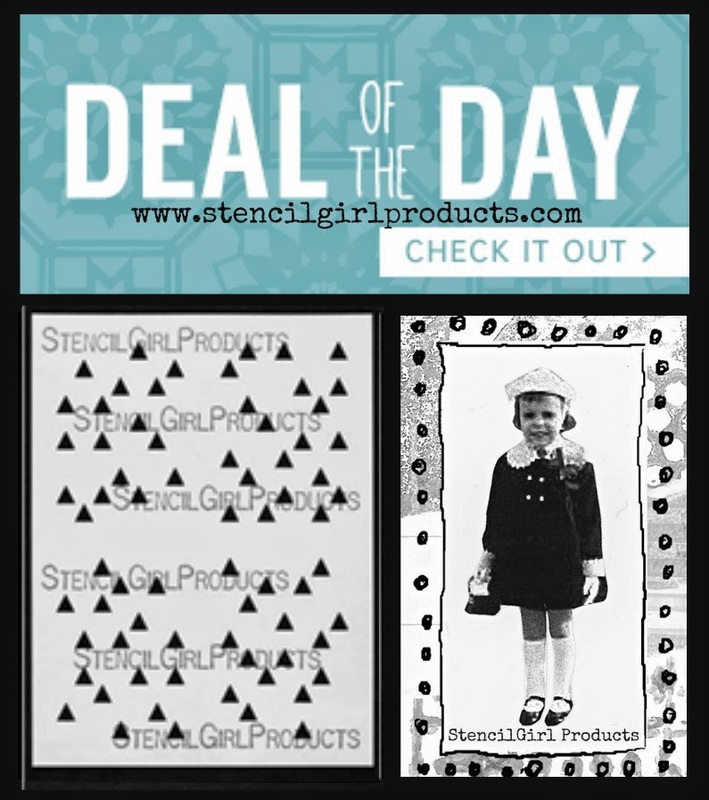 7 + 7 = 14% off your ENTIRE order of stencils on the StencilGirl Products website!!!! and YES our everyday discount of 10% off when you buy 6 or more of the same size also applies! and YES free shipping over $50 in the US still applies!!! Use Coupon Code HAPPYBDAYMB at checkout. Fine print....good for stencils ONLY, not good on books, DVD's, Deal of the Day or StencilClub. One time use per customer. 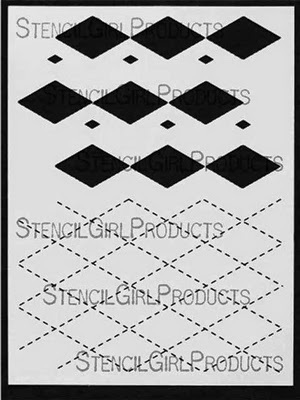 To be eligible for the stencil GIVEAWAY each day just leave a comment on StencilGirl Talk each day AND go over and leave a comment on the DLP blogs featured that day--links will be provided. All comments in each 24 hour period, on each of the blogs will be eligible. I am not really very familiar with Andrew, so I found this post so interesting and inspiring! Thank you, and now I'm off to check out his blog! And who knows, I may even win a stencil along the way…. Loved seeing how you use your stencils in DLP. I must try it out. Love all the creative ways to use stencils! Wow! Wow! Wow! Brilliant, Andrew! Thank you, thank you, thank you, Mary! I love those stencils! I'm gonna have to get me some! Great work! Thank you, Sherrinda! I would love to see what you will do with my stencils. Andrew is so ultra talented. I always enjoy seeing his DLP work. But I didn't know that he was also a stencil designer. And I love those graphic stencils. Hi Andrew! I enjoy all your work, Andrew, but that triangle/diamond match up is particularly sweet!! Love it! Always find myself studying Andrew's work for all the layers. Amazing! Andrews works is always amazing. I love the idea of using stenciled art as transfers! Me too! I do that so many times - it's so cool! Wow! Really cool...lots of different Ideas. these are so neat I love the curves dash stencil, I think its my favorite. Great projects Andrew. It's always interesting to see the creative ways you use stencils! Thanks for sharing how you've used them. 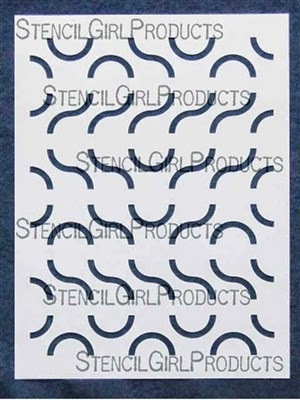 I have the curves dash stencil and I use it all the time! You're welcome, Denise, and glad you liked the curvies dash stencil. Love it, great ideas of using the stencils..I think I see a couple of new stencils in my future. love seeing a guys take on the stencil, love that shoe chevron page. I now need that Solid Curvies stencil! Thanks for the inspiration Andrew! I never grow tired of seeing how your creative mind works &drew! Thanks so much for sharing and inspiring and thanks also for being such a huge part of The Documented Life Project! Good stuff! I like simple graphics used in a more complex way! I find that the simpler the designs, the more versatile the stencil becomes. Awesome inspiration! Love the different ways the stencils were used! I found this really interesting, though I daresay that after doing your work, I would be too tired to do the events IN my calendar. Ah to be young. Do you actually do this every day in the calendar/journal or just for the week? How long does it really take? Fabulous stuff! LOVE the versatility of the Solid Curves stencil. Great spread, love the abstract designs! Love the curves dashed stencil, want it, need it.. NOW =) Thanks for sharing with us. Another blog to check out! Thanks for sharing your talent and creativity! Andrew, you're SO talented! Love all your stencils but especially the small & large diamonds. Of course, I love the solid curves as well. Love the versatility of your stencils. There are so many things you can do with them! Thanks for sharing your talents with us. Ooooo, I just wandered over here from the Art to the 5th site and DLP. I've subscribed to your youtube channel and e-mail newsletters. Can't wait to explore! Blog hop - great idea!! Wow ~ what a great variety of pages in your planner!! They are gorgeous pages! It's great to see how you incorporate the use of stencils. I am a big fan of chevron pattern. Andrew, your DLP pages with these stencils are incredible. Wow, what an amazing journey in your career! Love how you have cut these pages to add items and how you have elaborated on the stencil designs. Great work! Thanks for sharing. You are so welcome, Katie! Andrew, as always wonderful, masterful work. Thank you for sharing your art with us! What wonderful works of art! Love the art transfer technique. Will have to try that one out! Thanks for sharing! Love hearing the story behind the project. Chevron love! Thank you for sharing your passion. Andrew I always love seeing your work. Truly awesome! Some very unusual and creative ideas of using the stencils! I absolutely love Andrew's work! I have seen him on Facebook & the girls doing an interview with him. I would love to see Andrew teaching a class online. Wow ! Andrew's pages are stunning! LOVE that mini-triangle stencil. I can think of so many ways to use it!